All hybrids must be registered to be eligible for trophies. The above awards are presented in the form of a ribbon and a certificate. The ribbon indicates the nature of the award. Attached to the ribbon is a card showing the date, type of award, name of the plant, name of the exhibitor, average point score and the signature of the Chairman of Judging. The Judging Chairman attaches the ribbon and card to the winning plant or spike of flowers before it is officially photographed. A judging form is provided for this category, and an entry will be awarded a Blue Ribbon and a Certificate when the point score is 80 points or more. Five Judges’ approval is required; in those cases where five judges are not on the premises three judges will suffice. This award was adopted in 1954 by the Board of Directors and named in memory of David W. McLean, one of the founders of the Cymbidium Society of America, Inc. This award is in the form of a certificate and is granted to the exhibitor of that Cymbidium or Paphiopedilum plant inflorescence which shows novelty or improvement. Five Judges must approve the entry; in those cases where five judges are not on the premises three judges will suffice. No point score or form is to be used; description and measurements are to be provided. AWARD OF BREEDER’S MERIT – A.B.M. This award is granted to a group of five plants of an original cross which, in the opinion of the judges, is meritorious and which represents a desirable new line of breeding. Four plants must receive a point score award, and the other one be of near award quality. Earlier awarded clones may be included. Five judges must approve the award; in those cases where five judges are not on the premises three judges will suffice. A judging form will not be used for this award. The standard entry form for an exhibit will be used; and reason for granting the award shall be made by the judges. The award should be granted by a hand vote or secret ballot. This award may be used for granting recognition to a hybrid in a new line of breeding. This award will be granted but once to a cross. Both the exhibitor and the hybridizer shall receive certificates if they are different individuals. This medal was struck to honor Jack Hudlow and is loosely akin to the Westonbirt Medal of British Orchid Excellence. It may be given to an individual in recognition of distinguished service to The Cymbidium Society of America, Inc. to the genera of cymbidiums or paphiopedilums, or to the orchid world in general. The medal may be given at any show where Cymbidium Society judging is held or at any other show where the Board authorizes its issuance. A panel of five (5) judges shall make the selection; in those cases where five judges are not on the premises three judges will suffice. The purpose of the Gold Medal Award shall be to encourage the exhibition of cymbidiums and paphiopediums and/or phragmipediums. To be eligible there shall be not less than twelve (12) cymbidium or paphiopedium and/or phragmipedium plants in the exhibit. The exhibit shall be not less than 80 square feet for cymbidiums or 30 square feet. The Judging Chairman will read the point schedule before judging begins. The score for the exhibit shall be not less than 80 points. The medal shall be engraved in the name of the winner, who shall be given permanent possession of it. The exhibit may contain orchids of other genera. The Cymbidium Society of America, Inc. shall have the medals manufactured. The show will reimburse the Cymbidium Society for the cost. The Chairman of Awards shall be custodian of the medals and take care of all issuance. Each perpetual trophy winner will receive an engraved plaque. 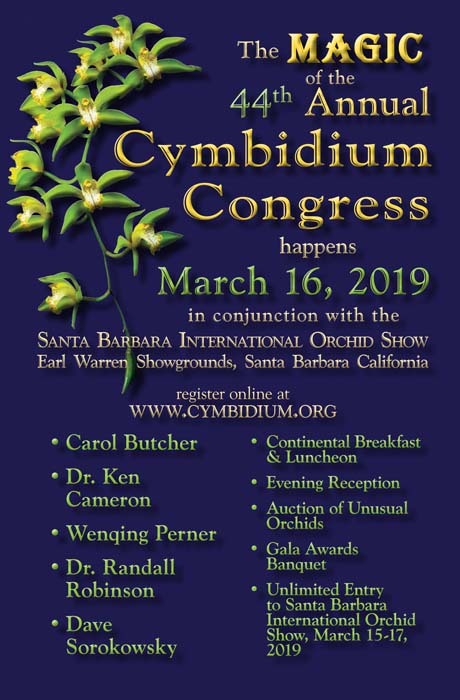 If any trophy is awarded to a person outside of the Southern California area the trophy is to remain in the custody of The Cymbidium Society of America, Inc. Name of winners will be engraved on the trophy. For the purpose of awarding trophies, fiowers awarded in the Northern hemisphere will be in competition with those awarded in the preceding Southern hemisphere season. This trophy is awarded annually to the Paphiopedilum exhibited by an amateur or private grower and receiving the highest point score. THE CYMBIDIUM SOCIETY OF AMERICA, INC. Donated in 1953 by Mr. Robert J. Crisman, it is a silver bowl given to the exhibitor of any hybrid standard Cymbidium registered in 1953 or later and grown for at least six months in California by an amateur. Competition is restricted to members of The Cymbidium Society of America, Inc. The plat must score 75 points or more. Who Owns Trophy: The trophy will be known as THE CYMBIDIUM SOCIETY OF AMERICA, INC. TROPHY and it will remain the property of The Cymbidium Society of America, Inc.
Those Eligible to Compete: Competition for the trophy will be open to amateur growers and breeders of standard cymbidium orchids within the State of California. Competition is restricted to members of The Cymbidium Society of America, Inc.
Period of Contest: The trophy will be awarded to the winner who qualifies during each cymbidium flowering season. California Bred and Grown Flowers: No cymbidium may qualify unless the cross was made and grown by the exhibitor in California for at least six months immediately prior to the date of exhibit. Remakes Not Eligible: No remakes of any cross registered and of record in Sander’s Orchid Register prior to 1953 are eligible to compete. Scoring of Flower: The trophy will be awarded annually to the exhibitor who receives the highest number of points, but it may not be awarded on less than 75 points. The names of the winner and the breeder will be engraved on the trophy. The point score formula to be used will be the one approved by The Cymbidium Society of America, Inc. Three judges must judge the flower. Entry Forms Necessary: Judging for the trophy shall not be made unless the exhibitor first completes the entry form. Where Judging Is Held: When approved by The Cymbidium Society of America, Inc., judging for the award may be done at any of the flower or orchid shows held within the State of California, or at any of the meetings of the Cymbidium Society or at any special judging of the Cymbidium Society. In Event of Tie: In the event of a tie, the trophy will be presented jointly to those who are tied and they may share custodianship on any agreeable basis approved by the Awards Committee of The Cymbidium Society of America, Inc. but each shall comply with all rules and regulations set forth herein. Date of Presentation and Publicity: The date of the award shall be determined by the Awards Committee of The Cymbidium Society of America, Inc. but must not be later than June 30th of each calendar year.Proper recognition and publicity shall be given the occasion and the winner at the time of award. Maintenance and Receipt: Each winner of the trophy must furinish a proper receipt for it at the time of delivery and agree to act as custodian of the trophy, to protect it, maintain it in good condition, and return it at the end of one year, immediately upon request from the Awards Chairman. Fire and theft insurance, including extended coverage, must be provided for the trophy by the Society. The amount of insurance must not be less than 80% of the intrinsic value of the trophy. Winner Must be an Individual: Only the individual who is not a member of a commercial orchid growing establishment and who has actually grown the awarded plant may win this trophy. It may not be awarded to a corporation, partnership, firm, or organization of any kind. Interpretation of Rules: The Awards Committee of the Cymbidium Society of America, Inc., shall make Interpretation of any rule or regulation governing this award with proper consideration given to the spirit of the rules and the intent of the donor. Any decision of the Award Committee shall be final and become a part of these rules. This trophy is awarded to that amateur grower whose Novelty or Miniaure Cymbidium scores the highest number of points (which must equal 75 or more) at an authorized Cymbidium Society of America, Inc. judging session. 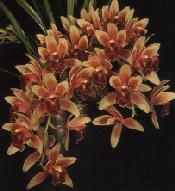 Competition is restricted to Cymbidium Society members. There is no limit to the number of plants that may be submitted. A specific cultivar form may not win more than once. Who Wins Trophy: The trophy shall be given each year to the amateur whose novelty or Miniature Cymbidium receives the highest score. Period of Contest: Judging will take place during the months when the Cymbidium Societies hold their meetings, from October through June. Amateur ~ A person who grows his own plants primarily for pleasure and does not derive his livelihood from sale of plants or flowers. Private Grower ~ A person who employs others to grow or assist in growing his plants but does not derive his livelihood from sale of plants or flowers. Commercial Grower ~ A person who grows plants with or without help and derives his livelihood from the sale of flowers and plants. Ownership of Plant: Ownership of plant shall be for at least six months preceding date of exhibition. Judging Procedure: The Standard Cymbidium Society of America, Inc. Judging form and procedures shall be used. Date of Award: The award shall be given at the June meeting each year or at such time as shall be decided by the President, such as at an Annual Banquet. Data to be Engraved: Each year, the year, name of winner, name of winning plant, and number of points shall be engraved on the trophy. Number of Plants Eligible: There is no limit to the number of plants that may be submitted for competition. Times Award May Be Won: There is no limit to the number of times a person may win the trophy. This trophy is a silver bowl donated by Gallup & Stribling. It is awarded yearly on a perpetual basis for that standard Cymbidium flower which has attained the highest point score for that year. In the event of a tie each owner will hold the trophy jointly. Only plants, which have received an award, are eligible and an award higher than any previous award received by the plant is required for eligibility. The period of judging is from October through May of each cymbidium flowering season. The trophy is to be awarded in June. Plants may be judged at The Cymbidium Society of America, Inc. Meetings or any show where The Cymbidium Society of America, Inc. officiates. Plants to be eligible must have received The Cymbidium Society of America, Inc. awards of the current season. Either a plant in spike or a cut spike is eligible. The Director’s trophy shall be awarded annually to the flower spike exhibited by an individual or commercial grower that is awarded by The Cymbidium Society of America, Inc. and receives the highest point score during the period of competition. Possession of this trophy shall be accorded to the winner for a period between the annual awards. The trophy shall be returned to the custody of The Cymbidium Society of America, Inc. upon demand of the Awards Chairman. In the event of a tie, each winner shall hold the trophy alternatively. After review of all awards given during the current season, the Awards Chairman will determine the winner of the trophy.